Kerwin Roach II made two late 3-pointers to help Texas reach overtime, where the Longhorns did just enough for a 73-71 victory against Arkansas on Friday night in the Armed Forces Classic. FORT BLISS, Texas (AP) - Kerwin Roach II made two late 3-pointers to help Texas reach overtime, where the Longhorns did just enough for a 73-71 victory against Arkansas on Friday night in the Armed Forces Classic. Roach led Texas (2-0) with 18 points. Jericho Sims added 14 points and Dylan Osetkowski had 11 with 13 rebounds. Arkansas (0-1) got a game-high 20 points from center Daniel Gafford, who also had a double-double with 12 rebounds. Isaiah Joe added 17 points for the Razorbacks, while Jalen Harris and Mason Jones each had 11. Arkansas trailed 36-30 at the half, but a 10-0 run midway through the second half allowed the Razorbacks to take a 49-47 lead after a 3-pointer by Joe. The Razorbacks outscored Texas 33-27 in the second half, but free-throw shooting kept the Longhorns in it. They went 14-for-20 shooting from the line in the second half and made 4 of 6 in overtime. That allowed Texas to overcome cold shooting, including a stretch of 9:47 without a field goal in the second half. A dunk by Gafford put Arkansas ahead 62-59 with a minute to play. After an air ball by Texas, Osetkowski made 1 of 2 free throws to make it 62-60. Gafford then missed the first of two free throws to push the lead to three, setting up Roach's tying 3-pointer with 1 second left that forced overtime. Friday's game was a look at two teams who are NCAA postseason regulars. Arkansas began its pursuit of a third consecutive NCAA tournament berth. 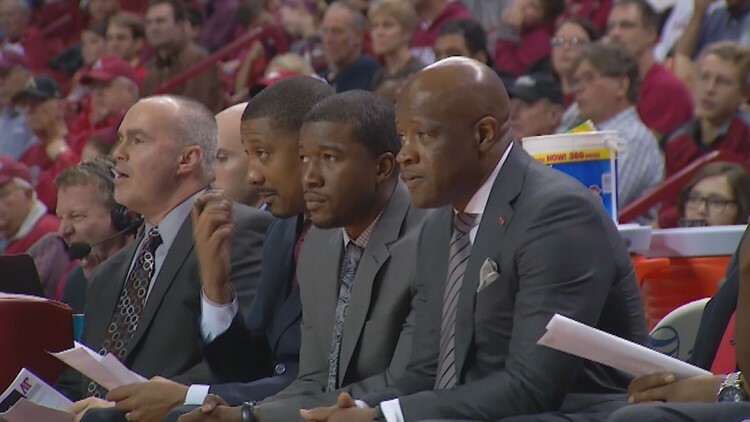 The Razorbacks, who were one of eight SEC teams in last year's NCAAs, have made the tournament three times in the past four years, and are looking to add to that with the nation's No. 25-ranked recruiting class. Arkansas was picked 10th in the preseason SEC poll. Texas played in its earliest season opener Friday. The Longhorns, who also made the NCAA tournament, return four of five starters from last year's team. Texas was picked fourth in the Big 12 preseason rankings. The Longhorns feature last year's No. 8-ranked recruiting class. Texas: The Longhorns continue their nonconference schedule with a home game Monday against Louisiana Monroe, followed by a home game on Friday against The Citadel. Arkansas: The Razorbacks get Saturday and Sunday off before hosting UC Davis on Monday, which is the first game of the Hardwood Showcase event. All games are at Arkansas' Bud Walton Arena. The Razorbacks will play Indiana (Nov. 18), Montana State (Nov. 21) and UT Arlington (Nov. 23) in their other games in the Showcase.